It would be an understatement to say that whole new worlds have opened up to me as a result of parenthood, but nothing brought this home more than discovering the toy section of a department store. You would think as a mother of a toddler, or perhaps even, as general citizen of the capitalist consumption world, that this would have been known to me sooner, but I only recently stumbled upon this kooky collection due to the increasing numbers of friends who are reproducing and the pressure I feel to buy something new for them, as opposed to sourcing everything from the op shop, as I have done for The Boy to date. Being unfamiliar with this section of the store, you can imagine my surprise when I found aisle upon aisle dedicated to selling toys that are based entirely upon the premise of imitating an adult world of domesticity and warfare, at the average price of 100 bucks a pop. It would have been sad, if it weren’t kind of weirdly funny. The first thing to catch my attention was a toy car that was kind of hard to ignore, this thing was like a Hummer on a crack-selling street corner, except that it was pink and had Dora The Explorer ‘tagged’ all over it. I nearly fell over when I realised it was on the market for a price near to that of my first, real car, at $340. Upon making this realisation, I promptly stopped looking for gifts and started noting a general inventory. First up was the Deluxe Supermarket Checkout, because as if getting dragged along with your oldies to do the grocery isn’t fun enough, you can now go home and ‘play pretend’. Who needs witches in the wardrobe and a sand pit full of lava, when you could be playing the Checkout Chick scanning food items? This little, or huge rather, gem, retails for about 70 bucks. 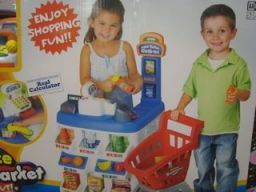 There is also a separate Ding Ding Cash Register available to avoid any nasty sibling squabbles over who is going to tally things up (like how much suckers are shelling out to buy this crap). They really have thought of everything. Also popular seems to be the farmyard theme. You can purchase a large barn complete with farmyard animals for no small price and simulate wholesome outdoor fun, without having to ever go outside! The great thing about the plastic farmyard is that it represents the kind of great outdoors that humans don’t have to feel very alien in, because instead of bush there are paddocks, and instead of wildlife there are domesticated animals, which is the perfect way to introduce children to our rightful place in the natural world as being at the top of things. Bringing the fun back to home, there was a Kitchen Package that would do any contemporary reno job proud – a lovely corner bench top complete with oven, microwave, espresso machine and ‘19 other accessories!’ But not like the pots, Tupperware, and dust pans that you might find in your actual kitchen (fake ones)! Yay! I then discovered a piece of cross-marketing genius when I saw a whole shelf dedicated to a range of Masterchef toys in the kitchen aisle. I can’t believe other TV shows have neglected to capitalise on the kind of exposure this branding must bring. Just think, all those kids, playing with your toys in front of other kids, I mean Masterchef could probably do away with the letter box drop with the kind of new audience it’s Masterchef Cupcake, Pizza, and Rice Kits must be bringing in. Further along there was a Stroll Along Pram, which is not a life sized pram of course, it’s a miniature one, designed for toddlers that want to practice becoming teenage mothers. 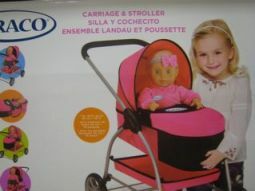 This was in the same aisle as a miniature Vacuum Cleaner (you really shouldn’t buy one without the other, because multitasking is an important part of the domestic life the child is in training for). 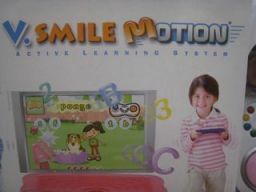 In an unclassifiable aisle I found Smile Motion, but even when I looked closer at the box I still couldn’t figure out what it was, although it must have been pretty useful because it cost $128 bucks. This was found alongside Smart Sports, which, from what I could tell, meant that you ‘outsmarted’ sport, by not really doing any and standing in front of your TV instead. 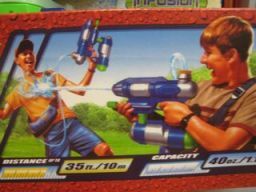 In the ‘outdoor’ section, for boys, obviously, there were plastic lawn mowers for the bargain price of $30, and semi-automatic weapons that came in boxes plastered with pictures of young boys engaged in water ‘warfare’. 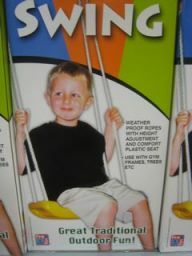 There was also a swing that came in a huge box with the words ‘traditional outdoor fun’ stamped all over it as though ‘outdoor’ and ‘fun’ had become outdated and there was nostalgia value to be had in employing these ‘ye olde’ tools of play. I was on a bit of a roll with my little inventory keeping, so when I found that the toy section had given way to the book section, I decided to peruse the Parenting titles. And what I found is that these two sections are surprisingly well matched; for what the crazy world of toys could take away from children, the books could give back. For example, there was Earthlight: Simple Visualisations to help your child Release Creativity, Enjoy Adventures, and Develop Inner Peace and Strength (because you are never too young to develop a self-help habit, and God knows, after playing with those toys your going to need all the help with ‘adventures’ that you can get). 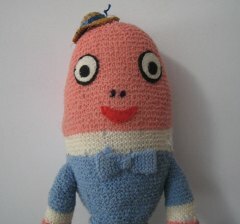 I think now what all we need is someone to sanitise an Abattoir in the form of a plastic toy, and we have the missing link. The kids can visit the animals on the farm, cart them off to the Abattoir when they are done, package up the meat for their Supermarket shelves, sell them to customers on their Ding Ding Cash register, go home to their kitchen, pour themselves an espresso, knock over a bit of vacuuming before doing the lawns, then put their feet up with a good copy of How to Raise an Amazing Child, all in good preparation for when its their turn to do it For Real. Michele Freeman is a teacher and writer based in Sydney. 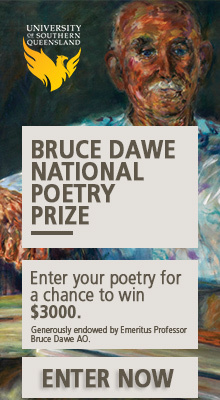 Her written work has been published in the Sydney Morning Herald, Daily Life, Meanjin and Overland. She has also produced stories for FBi Radio’s All the Best. In 2017, she was the recipient of the WestWords Emerging Writer’s Fellowship and is currently working on her first full-length novel, set in Sydney’s Western suburbs. Great article Michele – and so disturbing on so many levels. Have you ever been in a Steiner-inspired toyshop? Very different. Boredom and imagination are sides of the same coin. If everything they play with is ‘fixed’ and complete, and ‘entertains’ them: how can they ever get bored? How can they ever create stuff? And I’m not talking about the malaise that comes with being over-stimulated by boring stuff. The adultish, cultish, capitalist/materialism-driven hijacking of child’s play is a sinister tragedy of epic proportions.